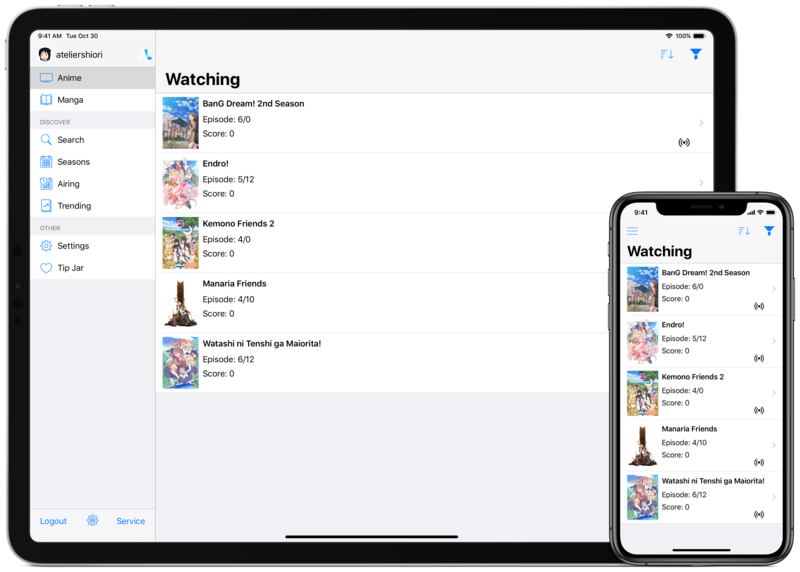 Shukofukurou is a native and lightweight multi service Anime and Manga Library management application for macOS and iOS that supports AniList, which allows you to manage your libraries easily from your Mac, iPhone or iPad. You can search and view title information, add new titles, import lists from different services and more. We are open source and our Github repo can be viewed here (Mac Version) and here (iOS Version). If you want to support this project, check out our donation page or support us on Patreon to find out how. 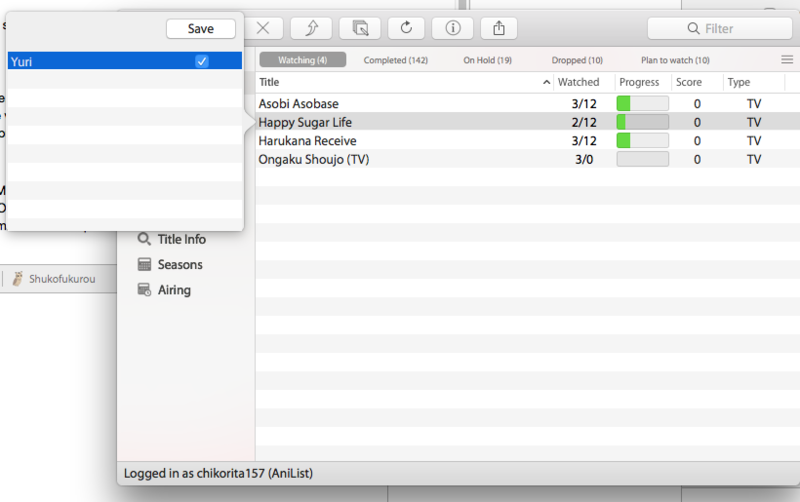 For automatic list update feature based on what you are watching, check out Hachidori. Shukofukurou for iOS will become free once we reach our Patreon goal of $10 or more a month for at least three months or more. 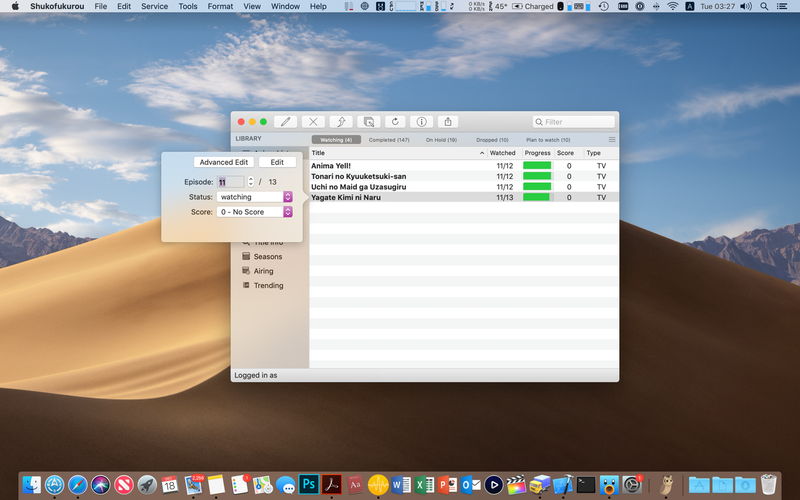 Mac: Current Version is 3.2.8 and requires macOS 10.11 El Capitan or later. iOS: Current version is 1.3 and requires iOS 11.4 or later. Note that some features like Manga List management, Profile and Character browser is reserved for people who donated to the project as a way to thank the user for supporting the project. The iOS version is paid app ($2.99) to cover distribution costs, but you may compile your own version for free by obtaining the source code (Note: Free Apple Developer accounts can only run the app on your iOS device for 7 days before you need to recompile it, unless you have a paid Apple Developer Account.). These are features that are time consuming to implement. Moreover, the Apple Developer's Program is required to distribute applications such as code signing the application so it won't cause issues with GateKeeper and distributing the app on the iOS App Store. This costs $99 a year including tax and it's not free, even if you distribute open source application. Without the program, I won't be able to continue developing the application since there is no way to distribute it. Official beta builds through TestFlight are only available for active patrons and people who downloaded the App. To request access, become an active patron and there should be an invite link. Note that you must maintain an active pledge. These restrictions only apply to the official binary and not the source code, which is free as in freedom. You are free to compile from source if you want these features for free since it's open source. Note that you need to provide the OAuth client id and secret before compiling the application. Otherwise, authorization won't work. Also, you will be responsible for compiling the updates as well. If you find this difficult, just use the official version. Testing Beta Versions of Shukofukurou. For macOS, these releases are obtainable on Github. They are marked as prerelease releases and will run independently from the main application as "Shukofukurou Next." App Store users can unlock the donor features in the beta releases. For iOS, beta builds are restricted to active patrons. This is mostly because we have to release through TestFlight, which the invite is only available to active patrons who support the development of our apps monthly. If you want to help test new iOS releases while supporting future development of our apps, see our Patreon page for details. Anime and Manga List Management with Custom List support and ability to edit notes, reconsume count, privacy and start/end dates. Released the 6th Alpha of MAL Library. This should fix a bunch of bugs from the previous build. The first beta should be done in a few weeks. Add Support for importing MAL XML, AniDB XML and Kitsu anime lists into AniList. Fix enabling/disabling of login and authorize button. Fix crashes when user attempts to load a NSFW title and the application not properly loading the placeholder image. Character browser still using MyAnimeList data when Kitsu service is used. This is because the Character and Staff APIs are incomplete on Kitsu. Beta 1 is now released. This fixes a bunch of bugs found in testing. Note that you can't upgrade directly to this build. You need to manually download it. Also MAL Library is now renamed to Shukofukurou. AniList Authorization now works on macOS Yosemite and El Capitan. Authorization Web View cookies will only clear on High Sierra or later. Fix crash when a title on AniList does not have a status specified. It will default to "not yet aired" or "not yet published." Fix position of the score and status fields when an Anime entry is being edited. Open in Shukofukurou (formerly Open in MAL Library) Safari Extension is now operable. Updated help, removed screenshots and included third party open source licenses. Add Tip Jar menu item (only after registering) to collect voluntary donations to support the app's development. For Mac App Store users, he or she may leave a tip/donation via in-app purchase. Show progress wheel indicating that a list is being synchronized/refreshed. Replace toolbar icons and use icons provided by Icons8. Hmm, after new update (maybe site update) app always force-quitting when I try to select AniList service. Fix have been uploaded to the App Store and once it's ready for release, I will release the non-app store version. Null values are causing the program to crash. Sorry about that. 3.0.2 is released, which fixes the crashing issues. It should be on the Mac App Store by tomorrow since I submitted it and Apple doesn't review apps during the weekend. You can install this update by checking for updates. If you can't update through the program, download the disk image from the first post. Fix crash when user refreshes a Kitsu list which have a title with no poster image. Fix crash when user refreshes an AniList list and have start and end dates missing either a year, month or day. Shukofukurou 3.0.5 is now released! This release adds two new features. 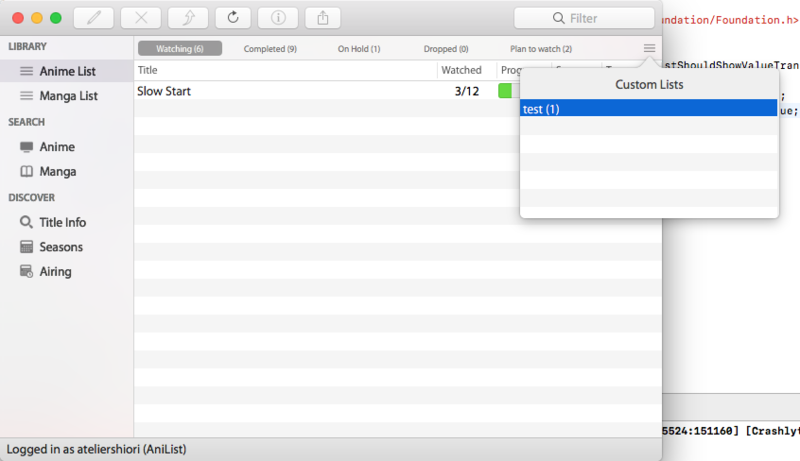 Now, you can increment the episodes or chapters by one without having to open the Edit popover. Also, an AniList list to MyAnimeList XML converter have been added. While not all titles will export with this converter, you can import your AniList or Kitsu list to MyAnimeList if you plan to use MyAnimeList as a backup. Also, this file will also serve as a backup since both AniList and Kitsu support MyAnimeList XML imports. I know MyAnimeList XML is an ancient and bad export format, but it's the only thing we have. To upgrade to this build, check for updates. The change log is below. Include missing fields in MyAnimeList XML so they can be used with MyAnimeList, Kitsu or AniList MyAnimeList XML import. Toolbar buttons in List View are disabled while a list update operation (Add/Update/Delete/Increment entries) is in progress. 3.0.7 is now released. It fixes a bunch of bugs and includes all the fixes from 3.0.6, which allows you to cancel the export operation and improves AniList > MyAnimeList XML Export. To install this, check for updates. For Mac App Store users, you can update to this build right now. Improve conversion of AniList/Kitsu lists to MyAnimeList XML so it doesn't hang during conversion. Add a cancel button in the progress window for Export to cancel the export operation. Fix bug where the incorrect search term appears after user views title information from search and switch back to the Search View. I have buy the App at the Store. Is it possible to edit and view the number how often i rewatch a Anime with my Anilist Account? If i double click on a Anime in the list and choose advanced edit then the values in the textboxes not correct, for example first i have seen 24/24 episodes, the advanced edit window shows 13/24. If you like for me to provide a test build (non-app store) to test to see if everything works, reply back and I will provide it. If it's okay, I will push it to the Mac App Store. I have added an option for editing the repeat count. I had searched the app in the store and bought it directly. I only noticed these two "problems" and wanted to ask, I didn't read any issues on GitHub. If there is a test version which offers the possibility to edit the number of times I have seen the anime and also the number of seen episodes are displayed correctly in the advanced edit window I like to test them. http://malupdaterosx.moe/shukofukurou-test.dmg <- Is this the URL to download the test build with the bugfixes and new function? Sorry for any mistakes in my posts, my English is anything but not good. Yes, the link that you provided has all the fixes. This is the version outside of the App Store. I just want you to test it with Anime to see if it's okay before I submit it. Ok I have installed the test build and will test it a bit, I haven't noticed any errors with the values that are displayed so far. Edit: Ok it works. I have speak with the support from Apple and now i can reinstall the App from the Store later when the new version is available in the store. 3.0.8 is now released It fixes some bugs with the Advanced Edit and adds the ability to edit the repeats/rewatch/reconsume/reread count, which is a requested feature that was easy to implement. Also, the status bar will now display the name of the current service for users who use the same username for all services. The change log is below and the update is now available on the Mac App Store and via software updates outside the App Store. List edit toolbar icons will disable when a list refresh is in progress. Thanks for the update, i had no problems with the test build and the number of rewatch. Now i install the app directly from the app store. 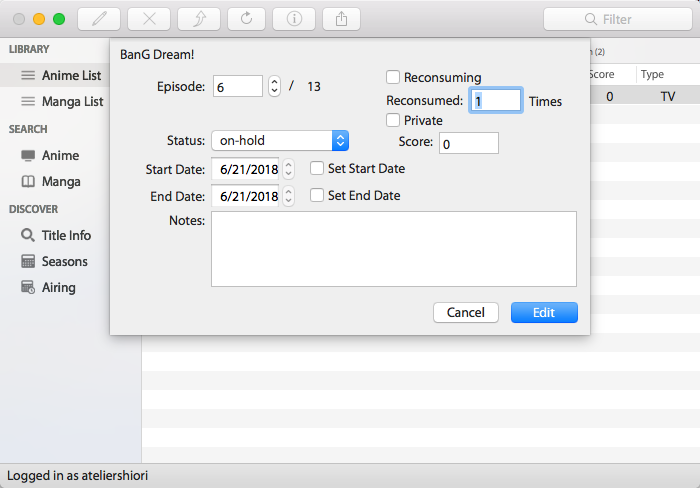 What i think is helpful would be if I set a series to finished if directly also the number of seen episodes is set and I have to do this not individually. FYI: The program will automatically set it to complete when you click the update button when the watched episodes or read chapters equal to the total episodes or chapter, except when the total episode or chapter is zero. Shukofukurou 3.0.9 is now released. It provide a few fixes to the AniList > MyAnimeList XML Exporter. Also, the Season Browser now uses season data provided by AniList. Unlike the old system, you can view season data dating back to the 1990s. You can update to this build via the Mac App Store or checking for updates. The change log is below. Use AniList Season Data for the Season Browser. User can now view season data dating back to 1990 to the current year. Show dialog at login notifying users how to switch between list services. AniList/Kitsu to MyAnimeList XML Exporter improvements. We have finally started work on 3.1, which brings a bunch of improvements. First off, Shukofukurou will no longer reload the whole list if you update or delete an entry. This will reduce the need to reload the whole list, especially if it's big. Adding a new title or having the list refresh automatically will sync the local list with the one online. The transition from JSON flat files to CoreData will pave way to list syncing in the future. I plan to add Custom List support, but it will only be for donors since it will be tricky to implement. The backend updates will help us when we port the App after releasing 3.1. Other planned features is changing the airing schedule source to use AniList instead of MyAnimeList scheduling. Also, I plan on adding episode airing notifications through the notification center somehow. Since this feature will take some work to implement, this will only be a donor only feature. Aside from these planned new features, most of the changes will be improvements. Shukofukurou 3.1 will ultimately require macOS El Capitan or later. After a first week, I decided to release a first prerelease build of Shukofukurou. There are still a bunch of things planned for the new release, which I haven't implemented yet. I just want feedback/bug testing as there are substantial changes on how lists are stored. In addition, converted list exports are now faster than ever. People who donated or supported this project can now use the custom lists feature. You can view custom lists and add or remove entries from custom lists as well. You can download the test build at GitHub. This release will run independently from the stable release. There is no migration for Mac App Store users, but it should be added in the next release for only test releases as 3.1 will be a free update for existing users once it's stable enough for release on the Mac App Store. Faster list updates compared to the previous version. Shukofukurou will no longer retrieve the whole list with each list update besides adding new titles and automatic/manual list refreshing. Converted List Exporting is now faster. The list views will keep the same scroll position when an entry is updated or the list is refreshed. The second Alpha release is now out which adds update_on_import options in Preferences and switches the Airing Browser to use AniList data. Note that if you use the Mac App Store version, the prerelease version will automatically migrate and you will have access to the Donor features. Airing Notifications are being worked on next release. You can install this release by checking for updates from the first Alpha. If you haven’t downloaded the prerelease builds yet, see the first post.. The change log is below. On test builds, the Mac App Store version will automatically migrate and unlock donor features. Shukofukurou 3.1 is now released with a bunch of improvements, including Custom Lists support for people who donated to the project. I am planning to use 3.1 as the basis to port the app to iOS. The iOS app will be open source. The change log is below. Shukofukurou will now save the last selected season in the Season Browser. Released a bunch of fixes (3.1.1 and 3.1.2) in the past two weeks. A release that contains full macOS Mojave support (e.g. Dark Mode) will come out when the final release comes out in a few weeks. Fix bug when a user tries to advanced edit a Manga entry and causes the app to crash. User won't automatically get logged out after an attempt to refresh user information fails since there is no internet connection. It will only logout now if the account information is invalid. Fix crash when a mapping containing a null title id is attempted. It will be skipped instead. Title ID Mappings when a user exports a list will only be imported once during the initial export. Title mappings for new titles that does not exist in the title id mappings will be looked up individually instead. 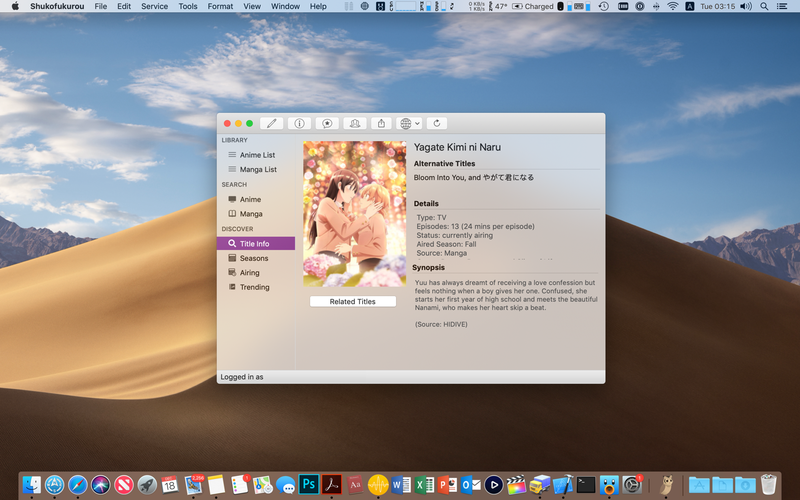 Shukofukurou 3.1.4 is now out, which adds full macOS Mojave compatibility with the new Dark Mode feature. This update is now on the Mac App Store and outside the App Store as well. As for the development funding goal for 2019, we are at 31%. More updates are in store during the Fall with a redesigned Season Browser and probably List Syncing. Airing/Publishing titles will appear as bold in the user's anime and manga lists. App is now notarized for macOS Mojave.